Following overwhelming demand and level of interest in Unison at Waterfront, Mirvac is excited to announce that construction of Unison stage 1, is now underway. 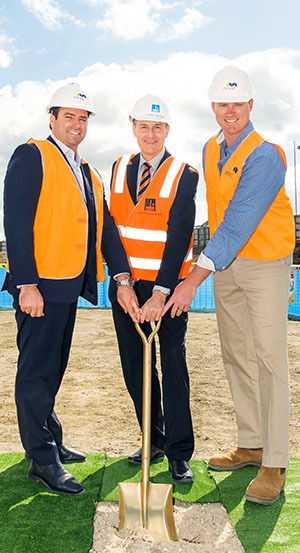 The Unison team was joined by Brisbane Lord Mayor Graham Quirk this week, who marked the project’s milestone with a sod-turning ceremony to launch the highly anticipated development. Unison is the third stage of Mirvac’s premiere Waterfront precinct - which includes the Pier and Park Residencies – and marks the developer’s next residential construction project in Queensland. With one bedroom apartments priced from $375,000, Unison will meet the increasing demand for attainable, yet sophisticated, urban dwellings in one of Brisbane’s most sought after areas. The Lord Mayor added that in addition to attracting home buyers to the area, Unison’s construction would also yield benefits for the local economy. “High-quality residential developments attract equally high-quality retailers and commercial operators, creating emerging pockets in Brisbane that provide the ease of city living coupled with a local community feel. Mirvac’s Group Executive, Residential, John Carfi, said Mirvac was delighted to be building again in Brisbane. In fact, overwhelming demand for Unison’s stage one development, Unison South, has resulted in plans to launch the second stage, Unison North, to the public earlier than anticipated. “All signs point to us needing to launch Unison North much earlier than we’d originally projected,” Mr Carfi said.